Fontaine Chalendray is a small rural village set on a hill top , just 10 minutes from a swimming lake with sandy beach. Approximately a 30 min drive from St Jean d'Angely in the Charente Maritime region of South West France. It is approximately a 1 hr 20 drive to the coast, beaches and the famous city of La Rochelle. The villa has recently been built (2009) and is decorated and equipped to a high standard providing a comfortable home away from home and ideal base from which to explore this beautiful region. Available for short summer lets and long winter lets too. We have been living in France offering self catering family friendly gites for rental since 1996. We have therefore gained a wealth of experience in what makes the perfect self catering, child friendly and family friendly gite holiday. We also have two children of our own so fully understand the needs of the family when booking a rental property in France. Wendy has become a registered child minder here in France so can now not only offer the evening babysitting but a day time creche service too. Our boys love having so many new friends to play with and are very sociable. Our guests enjoyment is extremely important to us, if you have a question, just ask we will be honest. Main spacious modern bathroom with bath, shower attachment, toilet and basin. Lots of hot water. En suite shower room to master bedroom with walk in shower, basin and toilet. Outside: Large picture windows look out onto the garden area, outdoor terrace with garden table,chairs, parasol and barbecue. There is a driveway with parking for several cars. Cleaning / Towels / Linen / Maid service: Bedlinen and towels are included in the rental price. We welcome families with young children and babies and can provide much more equipment than just a cot and high chair. We have sterilisers, baby baths, play mats, baby seats, non slip bath mats, toys, hand blenders, plastic crockery, cutlery, baby monitor, toddler step, potty, child toilet seat, pushchairs... just ask, if we have it you can borrow it. We can also cater for twins and triplets. Fontaine Chalendray is a small rural village set on a hill top. Just 10 minutes to a beautiful swimming lake with sandy beach. Approximately a 30min drive from St Jean d'Angely in the Charente Maritime region of South West France. 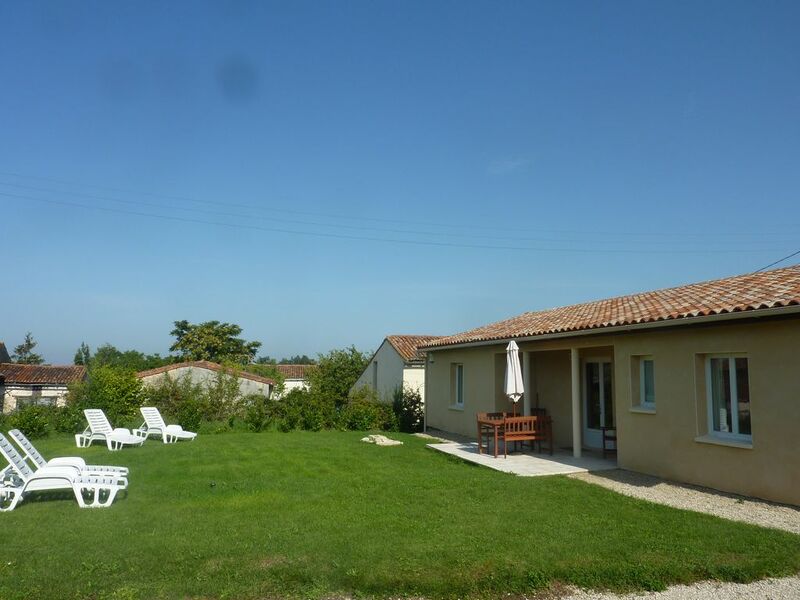 It is approximately a 1hr20 drive to the coast, beaches and the famous city of La Rochelle. La Rochelle , Poitiers, Limoges, Bordeaux airports.